This Samsung UN75MU9000 review will help you understand if this TV meets your requirements. The model belongs to MU9000 series and may cost you around $1,000. What's important, it uses the Edge LED backlight technology. It supports the 4K video standard with the 4K HDR extreme. The 4K Color Drive Extreme technology guarantees accurate reproducing of billions of colors. The Motion Rate of 240 assures blur-free video output. 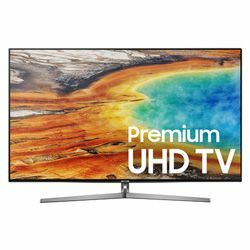 Another Samsung UN75MU9000 specs - this model has a Wi-Fi module so you can watch content from various online services. It also includes the Samsung Smart Hub, Voice interaction, Triple Black and other technologies. The smart remote controller can be used to control connected devices (only if they are compatible). It has 4 HDMI ports, 3 USB, a digital audio output and other ports that guarantee a perfect connection. The image quality is very high – no video stuttering, no blurring. The colors are rich. The black colors are truly dark. It also has various video enhancement technologies. The integrated speakers are quite powerful. It is easy to setup using a user-friendly UI. Some customers claim that the viewing angle is very narrow and you get colors degenerating even at a 10-degree angle. You may experience compatibility issues using it with another device (you may have troubles connecting an Onkyo receiver to the TV).